Part hair using a comb on whichever side you prefer. Apply Let’s Jam Regular Hold Shining & Conditioning gel to your hairline, particularly the front edges and nape of your neck for added hold and shine. Smooth hair with a boar bristle brush. Begin French braiding hair starting from your heavy side of part and working your way toward back of head. Finish the braid at your nape and secure. Repeat step 4 from the shallow side of your part. 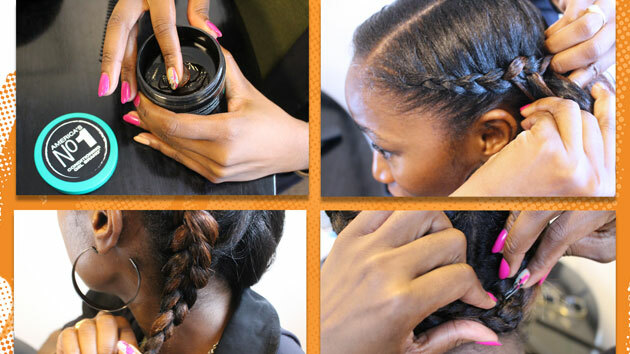 Crisscross loose ends of braids across nape area and use pins to secure. Can’t French braid? Try this look with a flat twist instead to achieve a similar look!